People with Oily Skin have some of the hardest times finding foundation that works for their face. Why? Because when your skin produces oil, that oil breaks down the makeup you are wearing. Today I am going to give you my best tips and tricks for getting makeup that works for your oily skin. Good skin care is the bets primer for oily skin. There are SO MANY oily skin regimens out there. I love the Clinique 3-step introduction kit for Oily Skin. It's an amazing value and a great way to see if the product is the right fit for you. 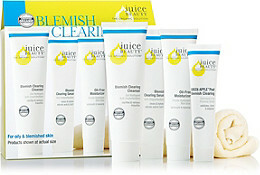 If you have acne too the Juice Beauty Blemish Clearing Solutions Kit (pictured on the left) is also a great place to start. Just make sure you are using moisturizer. It should be very light weight and oil-free, but your skin still needs moisture even though it's oily. If it's to dry your skin will produce MORE oil to compensate. Before Primer, after skincare, blot your skin. Using a rice paper or even tissue paper (or Klenex without lotion infused in it) to blot excess oil on your skin. 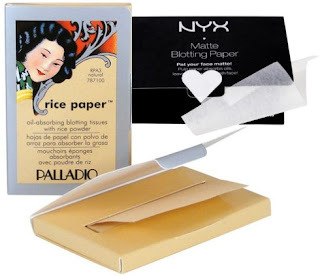 I love the NYX Blotting Paper ($4 - $6) and Palladio Rice Papers ($4.50). This is where things get tricky. A lot of people LOVE their liquid foundation, and I get it. I do. But you should really switch to powder. The myth that powder doesn't cover just isn't true. 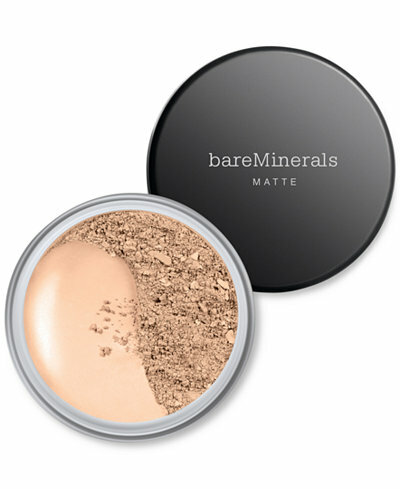 Their are a lot of full coverage powders available on the market. If you want a medium to fine coverage you have a lot of great options. But one of my favorites is the BareMinerals Original Loose Powder Foundation ($29) and the It Cosmetics Celebration Foundation ($35). If you need or want a more full coverage look try the BareMinerals Matte Loose Powder Foundation ($29) (pictured on the right) or the DermaBlend Intense Powder Camo Foundation ($34). The last set is finishing your look. If you didn't listen to me and you used a liquid foundation on your face anyways (at least make sure it's a matte finish one) then you NEED to use a powder and into a pray to set the look. My die-hard favorite powder is the Temptu Invisible Difference Finishing Powder ($35), but some others I like are the Makeup Revolution Baking Powders ($8) and the Pur Minerals Cosmetics Translucent Loose Setting Powder. BUT if you did listen to me then you should use a non-illuminating setting spray. My favorite ever is the Cover FX Mattifying Setting Spray ($31) (pictured on the left), but the TooFaced Hangover 3-in-1 Setting Spray ($32) is another option as well. Follow these tips and your makeup should last much longer!